MYTH: Myth: Adoption is expensive. REALITY: Private adoption can be expensive, but adopting children in need of a forever family from foster care costs NOTHING (here in Kansas). And, even private adoption costs can often be lowered. MYTH: You have to be married to adopt. REALITY: FALSE. Single people can adopt as well. MYTH: “Special Needs” means there are severe problems. 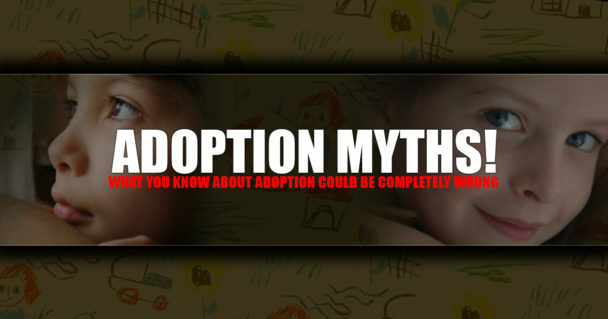 MYTH: Adopted kids don’t know they were adopted. REALITY: 97 percent of adopted children ages 5 and older know they were adopted. Early knowledge of this actually helps them! MYTH: All adopted kids have ADD, ADHD, emotional problems, or behavioral issues. REALITY: Any child, birth or adopted, can have medical, emotional, or behavioral issues. While adoption research varies regarding this statement, it is believed that many children do experience some sort of developmental or emotional issue. Some believe this is due to the genetic profile of the birth parents, lack of prenatal care, or the “trauma” of being adopted. There is additional debate about nature vs. nurture, with most agreeing that children are influenced by both their biological make-up and their environment. Early detection and support services help children and families develop adaptations and accommodation to these challenges. The majority of adopted children grow up to be successful in adult life. MYTH: Adopted kids have a void, or don’t ever feel part of a family. MYTH: A study shows that adopted kids don’t do well in Kindergarten. REALITY: This study may be true, but note that it’s for KINDNERGARTEN and 1st Grade. The differences often disappear later. REALITY: This might be true, but are you really going to guard your heart while the heart of a child breaks?